New Sgt. Windflower Book is at the Publishers!! We are very happy to announce that there will soon be another adventure in the Sgt. Windflower Mystery Series. 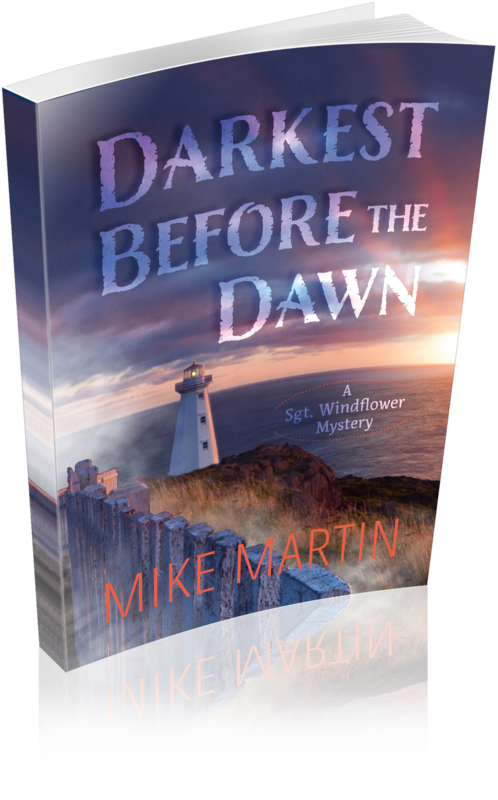 Darkest Before the Dawn will be released by Ottawa Press and Publishing on Oct 1. It has also been selected by Chapters/Indigo as a Local Author readers choice and will be profiled in Newfoundland and Atlantic Canada at select stores. Pretty exciting!! There’s a new member of the family and many of the old characters are back. Come in and sit down at the Mug-Up café for a bowl of moose soup and a chat with the locals. Maybe they’ll be talking about the “crime wave’ in Grand Bank or when the fog will blow back out into the Atlantic. Or maybe they’ll more interested in what kind of fancy cupcakes might be on offer today. They’re sum good b’y!! Oh. And wait til you meet Molly…. Advance review copies in pdf version will be available soon. If you want one, please e-mail me @ mike54martin@yahoo.ca or send a message in the contact form. Book Launch will be Ottawa in early October, likely at Books on Beechwood, my favourite independent bookstore in Ottawa.